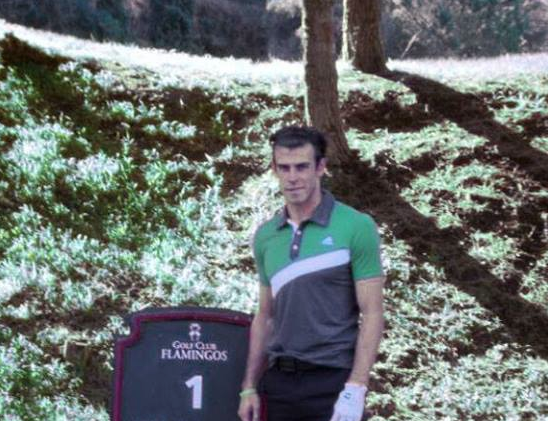 Gareth Frank Bale, footballer at Real Madrid, came and played to Golf at Flamingos Golf in Villa Padierna Palace Hotel in July 2014. The Welsh footballer Gareth Frank Bale, plays for La Liga club Real Madrid and the Wales national team as a winger. Bale began his professional career at Southampton, playing at left back and earning acclaim as a free kick specialist. He moved to Tottenham Hotspur in 2007, for an eventual £7 million fee. During his time at Spurs, managerial and tactical shifts saw him transform into a more offensive player. From the 2009–10 season, Bale became an integral part of the team, rising to international attention during the 2010–11 UEFA Champions League.In 2011 and 2013 he was named PFA Players' Player of the Year, and was named in the UEFA Team of the Year. In 2013 he was also named PFA Young Player of the Year and the FWA Footballer of the Year. On 1 September 2013, Bale was transferred to Spanish team Real Madrid for an undisclosed fee. The Spanish press and Real Madrid TV reported £77 million (€91 million), while the English press reported a world record transfer fee of £85.3 million (€100 million), which would be above Cristiano Ronaldo's transfer record fee of £80 million (€94 million). He played an integral role in his first season at Real Madrid, helping the club to win the Copa del Rey and the Champions League, scoring in both finals. Bale has received plaudits from his peers, who have described him as a footballer with "tremendous speed, great crossing ability, a great left foot and exceptional physical qualities". 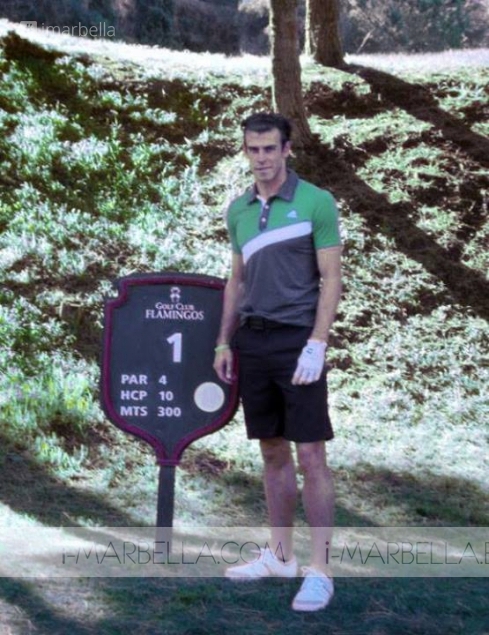 He was seen last week playing golf in Villa Padierna Flamingos Golf Course. Villa Padierna Palace Hotel, member of Small Luxury Hotels of the World, is one of the most luxurious hotels in the world and the recipient of a sixth star in 2012 from Seven Stars and Stripes, combines the distinction of a Tuscan palazzo with the luxury of a privileged setting. But besides the beautiful hotel, they also have three excellent golf courses and Villa Padierna Palace Hotel was awarded as World’s Best Golf Resort 2012 by the prestigious World Travel Awards (WTA). Villa Padierna Golf Club surrounds the Villa Padierna Palace Hotel in an environment that not only encourages guests to practice this sport, but also provides a great place for relaxation and wellbeing, conferring a sense of tranquillity and harmony to the entire resort. The golf club is located in a small valley, where the climate is mild and spring-like year-round and it has spectacular views of the Mediterranean Sea. On a clear day, it is even possible to sight the Moroccan coastline. It is located in the heart of the Costa el Sol, just a few miles away from Marbella and close to cities such as Seville, Granada or Gibraltar. Villa Padierna Golf Club has three 18- hole courses: Flamingos Golf, par 71, Alferini Golf, par 73 and Tramores Golf Club, with 18 holes and par 65. This 18 hole, 5,714 m. par 71 course, was designed by renowned architect Antonio Garcia Garrido and it boasts a pristine landscape, with lots of different species of trees and beautiful views of the Mediterranean Sea. The Greens are generous in size; the fairways are narrower on the first part of the course, where more precision is required than in the second; the bunkers are filled with crushed white marble; the fairways are sown with Bermuda, except on certain holes where grass has been used, whilst the greens and tees have been sown with Penncross. Flamingos Golf has hosted prestigious tournaments such as the European Seniors Tour Final in 2002, 2003, 2004 and in the year 2010 the Spanish Women's Open LTE.